to Bob Lass. The restruarnt at M-59 and Pontiac Lake rd. was named the Swan in the 60's and i rermemeber it was also called the pied piper sometime during that period. I remember coming out of the Navy and going there for fish dinners on Friday. alan wieling photoallisme@aol. com thanks al I was looking for photos of pied piper, frost top or Super Chief , telegrapg and dixie. I was a freelance photographer when the theater burned. my photos where some of the ice photos and fire photos. in oak pree. I also had all photos in the Waterford/Clarkston Reminder of the Huron fire. To Bob Lally, I think the name of the restaurant on the corner of M-59 and Pontiac Lake Rd was The Swan right? And wasn't it an A Frame building, all white?. I lived on the street right behind it, Myrtle, and remember the Huron Theater well. Everybody just called it the Huron. When we were kids, we would make a run up there to get a free bag of popcorn at Halloween, and I went to many saturday afternoon matinees to see the goofy kids movies that Disney made in the seventies. I actually worked there in my high school years, in the early 80's,and gave people as much butter as they wanted on their popcorn. Changing the letters on the marquis involved standing on a ladder with traffic zooming by on M-59. There was a standing area behind the seats, and the bathrooms were there, so you didn't have to leave the viewing area for long. There was a cry room upstairs, right next to the projector room, and there was a wooden stage in front of the screen. I remember the night the Huron burned down, because the fire was so bright it lit up the window shades of our house. When we lifted the shades, we could see the flames shooting out of the roof. I walked up there to watch. It was a bitterly cold night, and they had a hard time fighting the fire because their equipment kept freezing. They demolished the building soon after that. The Huron was owned by Francis C. Bouford and Forest Kistler. The original cost was $75,000. They also owned the Oakland and later Maple Leaf Dairy Co, on Howard street in Pontiac. I seem to remember the lobby to the Huron theater had the consesion stand to the left as you walk in, and you got your tickets from the little window by the outside door to the right, Now I can't remember if the enterance to the room ( Were you see the movies ) was strait as you walk in, or to the right, I remember now it was strait, as you go in you make a right and go down a long hall way to were the seats are, and I believe the bathrooms were to the right as you walk in, I wish someone could post some pictures of this place ( Inside ), It was such a old cool place to see movies for a cheap price Good Memories. Saw Hal Holbrook live here, on the stage in front of the screen, do his Mark Twain Tonight show. That was around 1962, and I was too young to appreciate it. I also remember seeing Porgy and Bess there, but am not sure of the year. Had to be somewhere between 1959 and 1963. There was a strip mall on the other side of Telegraph called Tel-Huron, I remember. Correction, it was Christmas Eve. Sorry about that. 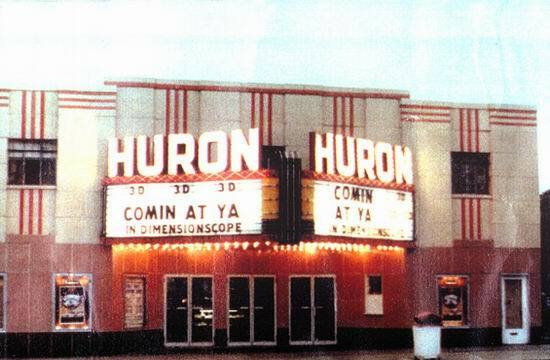 The Huron Theater burned down on New Years Eve 1983. The last two movies to show there were ''The Return of the Jedi'' and ''The Dead Zone''. I know because I lived about a half mile away, went there quite often and hung around when they were tearing down the rubble. The demolition guys gave me a lot of stuff. I even have a piece of glass from the marquee (the last piece in existence, no doubt - lol), a bunch of tickets from a roll, some little ''Now Showing'' plates, a movie reel and the big aluminum letters from ''Return of the Jedi''. I really liked that cool clock that was down by the left exit door. I remember it was light bluish. I went into the rubble after the fire to find it (a whole wall was down on the right) but the clock was burnt to a crisp. I was quite the little scavenger back then!!. For Bob Lally, is the restaurant you remember The Pied Piper? As a kid, we''d go there on Friday nite for Pizza, and you could watch it being made thru a window looking over the parking lot. Opposite corner had the Waterford Rolladium and Stapleton''s, where I first fell in love with racing on their HUGE slot car tracks. Many fond memories of the Huron. Last time there we saw Halloween for the first time,had to be about 1980. P. S. Does anyone remember the name of the restaurant at M59 and Pontiac Lake Rd during the early 1960s?If ya do and respond,thanks in advance. Remember the Huron Theatre seeing the first movie indoors Camelot in 1967 starring Richard Harris and Vanessa Redgrave. The glo-dial clock would fascinate me. Many other movies growing up was at Waterford, Miracle Mile, Blue Sky and Pontiac drive-ins (with an occasional stop first at Blue Star drive-in , for a cheeseburger and root beer). The Huron theatre had a fire the winter of 1986. They were showing Return of the Jedi. The fire department''s water froze in the hoses and it burned to the ground. It was owned by Felice''s Supermarket across the street after being owned by an older couple since the 1940''s. Within a month it was bulldozed for a new strip mall. I keep trying to locate photo''s of the interior,especially the neon clock and art deco sconces on each side of the wall from the screen. I remember it as a purple or blue Glo-Dial Aztec model or similar with a Black Dial and white numbers reflecting the Neon ring inside the dial. Please E-mail me if I''m wrong. The local paper The Oakland Press had a Sunday magazine about it in the early 1980''s. I''ve always wanted a replica of the clock. My family were regular customers from 1973 to 1986. Does anyone have any pictures of the Lobby, or the seating area of the theater, please post them if you have them, thank you. New InformationZip Code: 48341Capacity: 426. I remember going to the huron Theater when i was a kid, many,many,many years ago, all that I can remember seeing there was some 3 D movies, and a movie called Laserblast ( wich is now out on DVD ), The Huron Theater was one of the classiest made theaters I had went to when i was a kid, it had that classic feel to it, I do remember there were Black and white tiles for the flooring in the loby, they had the old style popcorn maker with the logo Popcorn I remember that the Theater was long, and it only had one screen, and it had red material drapings on the walls, and the curtains in front of the theater screen that would open up before the movie would start, I will always remember this theater, like I said it was a classic. 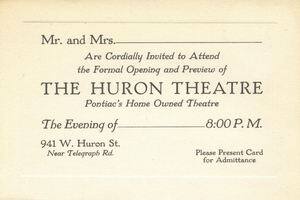 The huron theater was located in waterford township, telegraph road was the border for pontiac and waterford in this particular area. I know this for a fact. I lived right there by the theater for 12 years from 1977-1989. I grew up there. all the kids that lived in that area also went to waterford schools. I had a couple of friends that lived right behind the theater. Anyone know where any more pictures of the theater is. I miss this theater these pictures I remember. it was really cool and really affordable like $0. 50 a show I think cant remember. Are school Donelson Elemetary use to take the whole school there on the last day of the year for like $1. 25 that included the movie,a pop, and a popcorn I think. I remember seeing Peter Pan there. And superman 2. I saw other movies there but cant remember. Anyone out there I want to see more pictures even pictures of when it burnt down. I know there is someone out there with lots of cool pictures. Would especially like to see the concession stand would be neat. This theater was on Huron Street, about one block west of Telegraph Road in Waterford Township, MI, and next building to the west was the A&P store (which is now called GI Joes Surplus), then next west was Josephine street. And across Huron Street is a small row of stores, that still has Harwood Uniforms (been there forever, ask the cops). When Huron Theater burned to the ground, the owners rebuilt to a u-shaped group of small stores, but even the Shoe Store finally moved west to the Meijers area. This theater burned in 1986 while showing Return of the Jedi. The Oakland press did a photo story in the Sunday Magazine shortly before showing the interior with a purple Glo-Dial clock to the left of the red velvet curtains. The date of the fire was close to Christmas. It was replaced by a strip mall within 10 months: owned by the grocery store across the street. Cause of the fire was found to be some items too close to the water heater or Furnace. Also, this theater is in downtown Pontiac. not Waterford. My parents took us in the 1970's to see all the classic Disney cartoons. I wish I had photos to do a miniature of it for my model railroad layout.